In a similar vein, a gospel song says, "Fear not tomorrow. God is already there." I am thankful for Our Lord's care for all those whom I love, both friends I have never met in person, including those I have "met" through W4, and my immediate family and in-person friends. I am thankful for God's omniscience and perfect goodness. The faith expressed in that prayer is that God's intentions towards those we love are always intentions of benevolence, even if He permits hardship or pain to come to them, even if He does not make the entirety of the road ahead clear. God is not taken by surprise by the future, but He does not merely indifferently observe it. Rather, he is actively seeking the highest good of all those whom I love. I am also thankful for my church, St. Patrick's Anglican Church. St. Patrick's is a living disproof of adages about the unsustainability of small congregations, as its small congregation has been sustaining itself for well over two decades. I have been there for just over eighteen years. There I have received the great blessing of services using traditional Anglican liturgy and, more importantly, the Eucharist. Third, and descending from the sublime to the mundane, I am thankful for God's provision of food. I love food very much, and my closer friends know that I have become even more interested in the last few years in trying new recipes. The form of Thanksgiving dinner, however, has been fixed in stone in the McGrew household for some years and will remain unchanged this year as well. My daughters have vetoed even the minor change of placing clementines rather than full-sized oranges into the fruit centerpiece. Children are natural traditionalists. God has been gracious unto our land in bringing us both the peace and the natural resources to have an abundance of food. We should never take this for granted but always give Him thanks for this blessing; let us also not fail to remember those who are in need. There is a (possibly apocryphal) story of Thomas Merton's visit to the Buddhist temples of Tibet. He is said to have asked a group of the chief monks there to write, in secret, a single word that described for them the main principle of religion. He did the same, and when all were revealed, the same word appeared on each ballot: Gratitude. The blessing of my children, through whom I participate in the ultimate mystery of God's self-giving love. All the beasts, and especially those that we love as pets, who teach us in their innocence the virtues of loyalty, meekness, and pity. The Holy Catholic Church, the instantiation of the fruitful love of God's only Son, and the deposit of wisdom bequeathed to us by the Spirit. The many trials, pains, and sufferings of this life. May we pray always to accept these for the the opportunities to grow in holiness that they are, in truth. Our earthly Mothers and Fathers through whom we are given life, learning, and the image of the One Holy Family. In that vein, my deepest offering of thanks this year: For my late father, John J. McLaughlin III, who sailed home to his eternal reward on April 3rd, 2013, I am always grateful. I am especially thankful for the special closeness and access to him that I now have, since he has joined the communion of saints, and for the singular opportunity I was given to pray the Divine Office with him in his last days. Finally, for Friendship, of which C.S. Lewis asked, "Who could have deserved it?" For friends old and new, near and distant, and particularly for my blogging compatriots at WWWtW, from whom I continue to learn so much, I am forever thankful. In his beloved Thanksgiving Proclamation of 1789, President Washington expressed the nation’s gratitude for “the signal and manifold mercies,” “the favorable interpositions of Providence” and “the great degree of tranquility, union, and plenty” granted to America. Every American owes thanks for those things still today. But more than ever we must heed Washington’s more somber words: that “we may then unite in most humbly offering our prayers and supplications to the great Lord and Ruler of Nations and beseech him to pardon our national and other transgressions.” Have mercy on us, Lord, a nation of sinners. I am thankful particularly for the warmth, love and generosity of family: my wife, my children, in-laws, cousins, brothers, aunts, uncles, mother and father. Though many are distant in space, they are always near to my heart. I give thanks for liberty, darkened now by innumerable threats. We are not far from the day when criticism of the antinomian sexual orthodoxy of our day will be proscribed and its critics jailed. Our surest redoubt against these threats, after “prayers and supplications to the great Lord and Ruler of Nations,” remains where it has always been: in the very traditions, proclamations and documents of our country. Finally, I give thanks for the friendships forged in contest against these threats to American liberty. The ground of all conservative politics is gratitude. We inherit blessings that we did not earn. I am particularly thankful this year for the blessings of family. I write this from Arizona where we have gathered from around the country to enjoy a traditional Thanksgiving meal with my aunt and uncle and my extended family (all the sisters-law and my two wonderful nieces). I am thankful for the happy warriors that you all are and for the fellowship that you prove can exist even in the virtual world of the Internet. 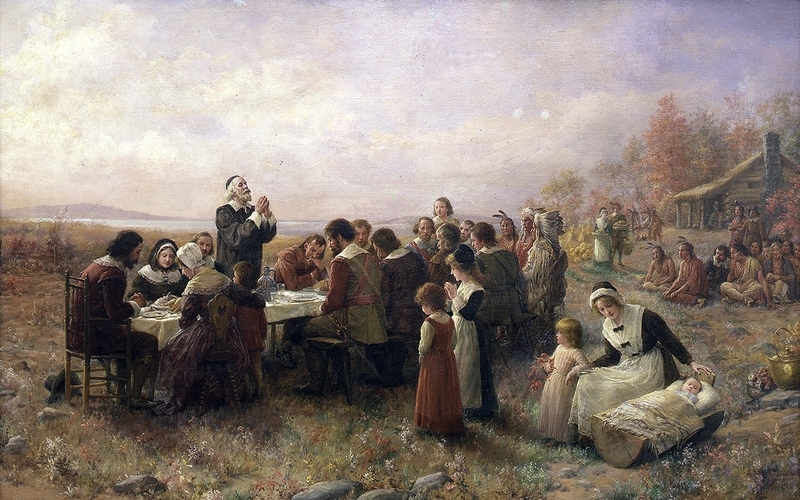 May the Lord bless your Thanksgiving Day richly, and all days to come. Thank you for sharing your wisdom and wit and gratitude with us. Well said, one and all. Happy Thanksgiving. A Happy Thanksgiving, Beth and Jeff, to you and yours. We are so glad you read W4. At mass this morning, our pastor reminded us that all of us, no matter what station, undergo both joys and sorrows. Today we take note especially of the joyful things, but since "we know that all things work together for good to them that love God" we should be mindful also to give thanks for our trials by which He purifies us. That's hard, I don't find that coming easily at all. On another note: Please pray for my Uncle Frank, who most likely will die today or tomorrow. He has lived a long, full life, but has borne his share of suffering as well. May the Lord bless your family in this time, Tony, and keep before you lovely memories in the midst of the sorrow of loss. Beth and Jeff C, glad you could visit today. Someday we will all feast together and be thankful many times over for the ways in which our friends help us along the road. With friends like you, what can our enemies do to us? Just saw this, Tony. You and your uncle certainly will be in our prayers.